I fully intended this to be a delightful post about vintage shops in Amsterdam, but unfortunately i found the vintage shops severely lacking. Yes, Amsterdam had lots of cool independent shops, but almost all of the vintage stores were incredibly samey offering little other than what i would refer to as “student vintage” (printed shirts, novelty jumpers, cut off levi’s…that kind of thing). So instead i’ll offer a review of one of the museums I visited whilst I was there, and boy it was good. This delightful museum is located in one of the imposingly tall canal houses that cover Amsterdam. The handbag museum not only contains amazing bags and purses but is also housed within a completely stunning building. The museum itself is spread over 4 floors. You start at the top and work your way down. Starting with 16th-19th century bags and purses on the 4th floor ( here there were some truly show stopping early examples including beaded reticules and pockets). On the 3rd floor is 20th-21st century handbags with some of the most jaw dropping art deco bags I have ever seen and a crazy collection of lucite bags too. The 2nd floor is a temporary exhibition space which currently is “out on the twon” showcasing a delightful selection of shoes, bags and hats. All of the shoes on display were loaned by Northampton shoe museum, making me even more desperate to go! The museum finishes on the ground floor with a great shop which sells some spectacular designer handbags. First-class passengers received this clutch on the maiden voyage of the Normandie, the most luxurious cruise ship of the time which sailed from Le Havre via Southampton to New York. Another highlight. I remember seeing one of these in black go for crazy money on ebay a few years back. Fashion designer Elsa Schiaparelli caused a stir in the 1930s with her surrealistic fashion accessories and bags. From the 1940s, the designers Enid Collins and Anne-Marie of France started designing striking bags. I would highly recommend a visit to this museum. Not only do they have some amazing objects on display but the showcases are fantastically well laid out, allowing you to really see the items on display and there is text available in English. During my time at the museum service I have had a couple, what I would call “eureka” moments. For me that is discovering a garment in the collection advertised in a magazine or finding some kind of importance provenance. This happened twice whilst I was working on Little black dress. 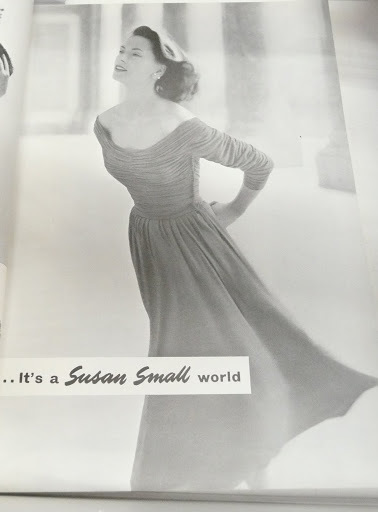 The first moment was with a dress by the company Susan Small. Whilst searching through copies of Vogues to display in the exhibition I suddenly stumbled across one of the dresses I had picked out! It was a real, goodness me! Moment. 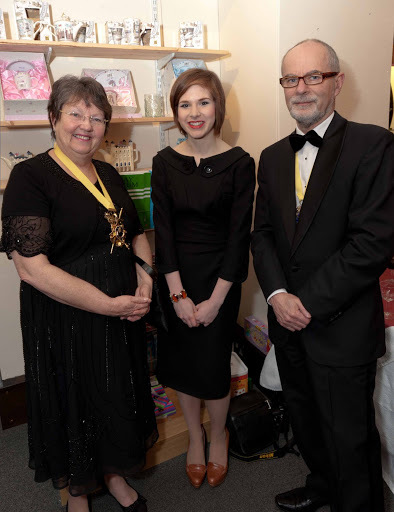 Seeing a dress in the collection on a human form really helps to give it a different meaning and helps you to see how it would have been worn at the time. The only problem with the image on the panel was that it was quite small and difficult to see. Thankfully it was dated to 1956. I thought, maybe, just maybe this had come from a Vogue advertisement. 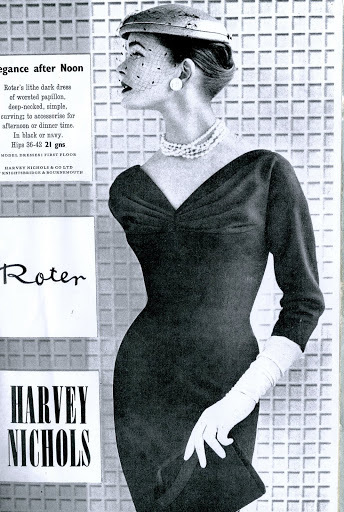 So, again I went searching, and found it in the March 1956 issues of Vogue. 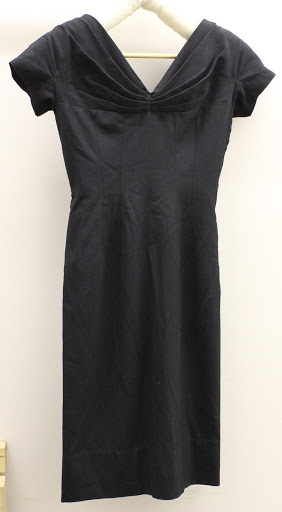 I was very happy to have this kind of provenance appear again, and even better the dress had its full price and fabric details in the advertisement. It is little details like this which really help to make exhibitions interesting for the public, all I can say is that I am pleased that my casual flicking turned up trumps on two occasions! 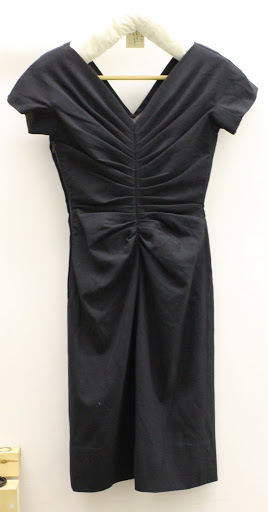 Little black dress is up! 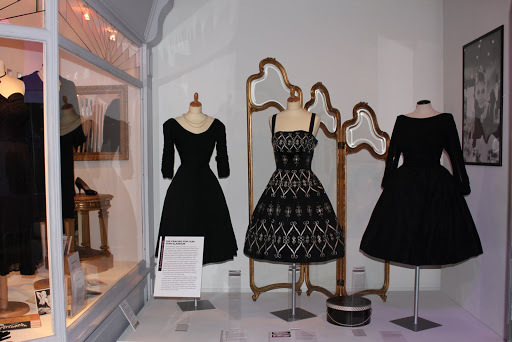 So, Little Black Dress is now up at Portsmouth City Museum! I urge anyone who is in the local area to go and see it. 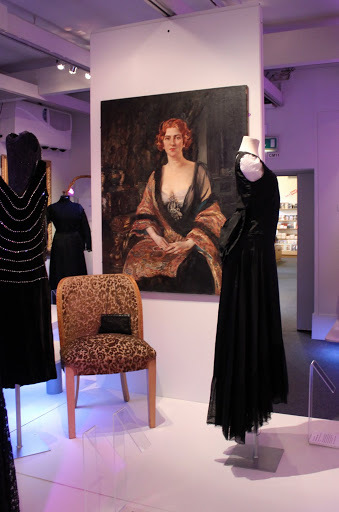 There are so many fabulous pieces to see there including a dress which once belonged to Marilyn Monroe! One of the dresses in the first image is a Frank Usher cocktail dress embellished with rhinestones and metallic embroidery. I think it has to be one of my favourite pieces in the whole Hampshire museums collection. Such a beauty! 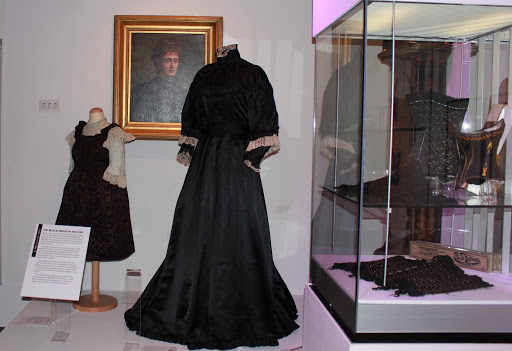 If anyone would like any more info on the exhibition or on any of the dresses, let me know. 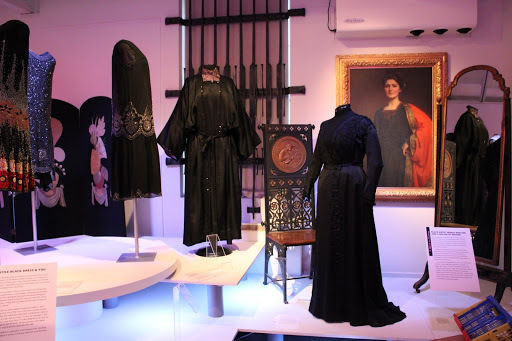 The exhibition is on until the 5th June and its free!